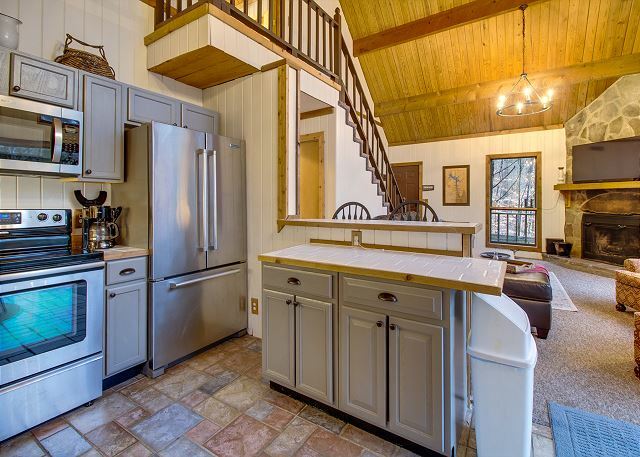 Smithville, TN United States - Sunday Morning | Center Hill Chalets Inc.
As of January 2019 newly remolded and decorated! This is a must see! That perfect place to get away from it all, is Sunday Morning. 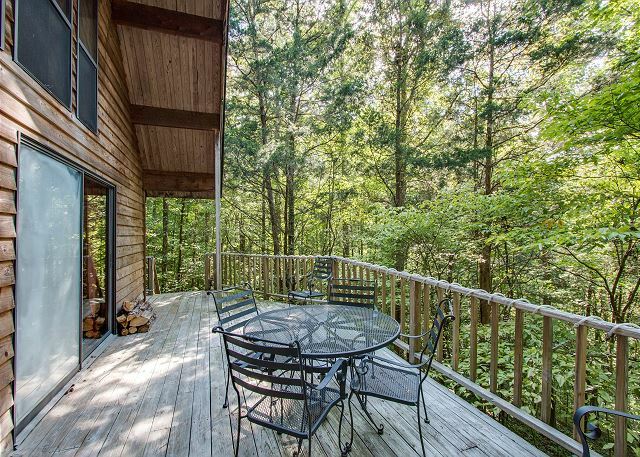 Hidden way back in the quiet woods where you can sit on the big wrap around porch and take in the wildlife scenery. 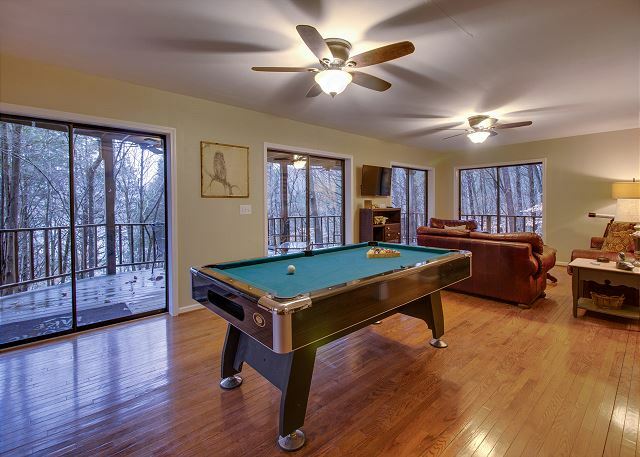 There is a hot tub and a wood fireplace to help make your stay more memorable. 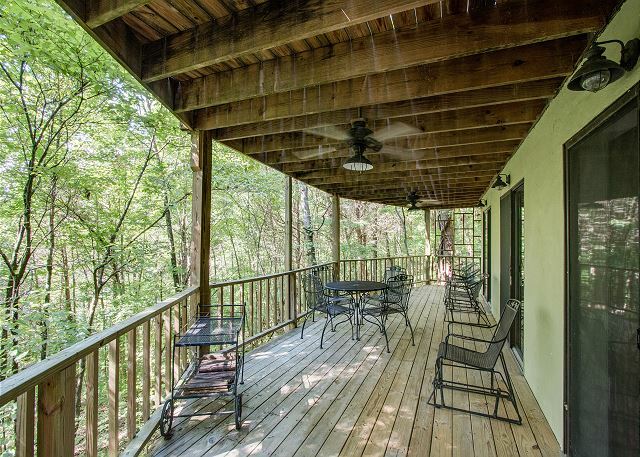 This house is a quiet place to enjoy with three comfortable bedrooms and bathrooms to accommodate your every need. The open kitchen/ living room plan with huge windows enhances the lighting in the rooms. 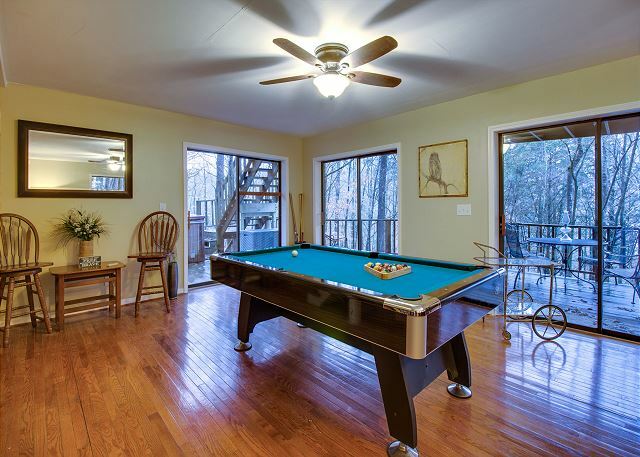 The Recreation Room with the pool table opens up to the deck and will be a huge hit with any age group. Enjoy high speed internet, a high definition flat screen TV in the living room and in every bedroom. In addition, you will be able to enjoy Direct TV Now and Roku on every TV. Don't miss out on this home, it has something to offer year round. This unit has a neighborhood access ramp for your boating needs. You will be conveniently located to Hurricane Marina and Floating Mill. NOTE: This house has over twenty-five steps down to the house. My husband and I brought our dog with us for our anniversary weekend getaway. Sunday Morning provided everything we needed for a quite relaxing weekend. We built a fire in the lovely fireplace and spent time in the wonderful hot tub each night. 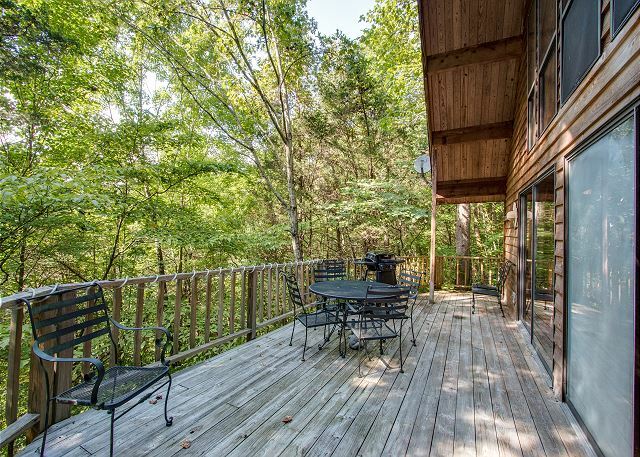 We drank coffee on the deck each morning as we gazed at the quite lake. We will definitely come back. Happy Anniversary! We are glad you enjoyed your time and look forward to your return! Awesome cabin in nature. This is a place that allows you to be immersed in nature. We loved the feeling of seclusion being in the middle of the woods rather than on the roadside. Wifi, Grill, Hottub pool table were all great to have for the family. We also like the way the cabin was decorated and made it feel more true to the cabin theme. Aside from initial concerns of double booking (it seems the neighbors like to use the parking space when the cabin is unoccupied, which was very quickly cleared up with a call to the emergency number - it was the weekend), everything went quite smoothly. 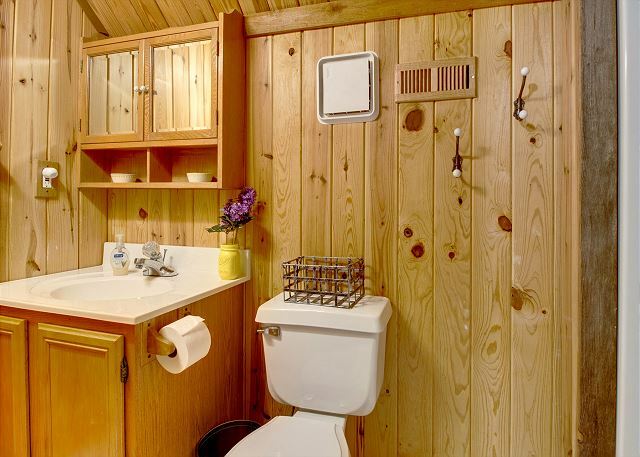 The cabin was well stocked with basic kitchen items and plenty of clean bedding and towels. The wraparound porch was PERFECT for viewing the 2017 eclipse at totality. It is quite convenient to town, which has a walmart and quite a few fast food restaurants. Some of the doors are a bit off, and some spots of the floor seem to slope a bit. A couple of the sliding glass doors appear permanently fogged. Hot water heater is fantastic. Hot tub is great. Overall, the negatives were small and would gladly stay again/recommend to others. We had a great time in this cabin! It was perfectly laid out for our situation & had everything we needed/wanted. It was comfortable & quiet. If you're looking for quick lake access this probably isn't your place but if you don't mind a short 10 min drive to the marina it's PERFECT! We are glad you enjoyed your stay. Sunday Morning is about 10 minutes from Hurricane or Sligo Marinas, however there is a small community boat ramp at the end of the road. We look forward to your next visit! Thank you for your review! I have worked with Center Hill Chalets in the past and they have always been nothing but wonderful - this was no different. However, when I got there - I had no clue how to work the keylock to open the door. (These instructions might want to be put into the directions that you send out with the code). I called the after hours number and the gentleman I spoke to was SO wonderful. He explained it to me - I got in - but then had to call back when I realized I couldn't figure out how to lock it. The cabin itself was very clean and beautiful. The surroundings were so peaceful. I didn't want to leave. I was a bit dismayed at the TV because I couldn't for anything get it to work. It had the Amazon fire stick and I had no clue how to work it and I tried everything I could. So by the 2nd day, I just gave up. Maybe possibly have those instructions somewhere as well for people like me. 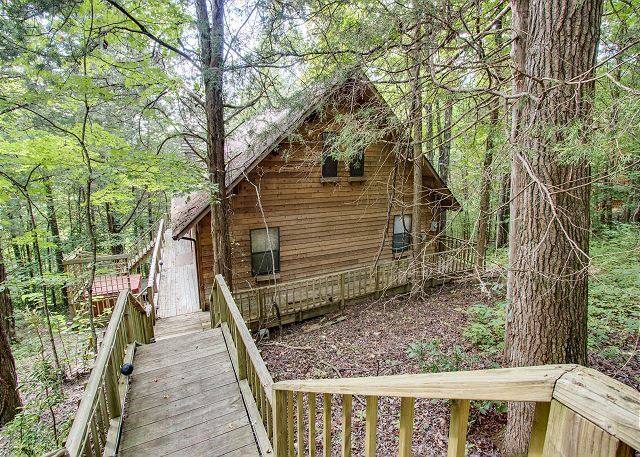 Overall, I would stay there again in a minute - I think this was my favorite cabin out of all of them that I have stayed at and this company never fails to be so professional and so wonderful. We are glad you enjoyed your stay, and we will add instructions to the Amazon fire stick in the house. Thank you for your suggestion and review!